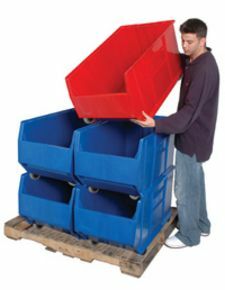 Jumbo bins with casters make it possible for you to move bulk items from one work area to another. The 3" casters swivel and each has brakes for easy mobility and locking in place. Bins can be stacked. QUS964MOB 23-7/8"D x 16-1/2"W x 11"H 16-1/2" 11"
QUS965MOB 23-7/8"D x 18-1/4"W x 12"H 18-1/4" 12"
QUS984MOB 29-7/8"D x 16-1/2"W x 11"H 18-1/4" 11"
QUS986MOB 29-7/8"D x 16-1/2"W x 15"H 16-1/2" 15"
QUS985MOB 29-7/8"D x 18-1/4"W x 12"H 18-1/4" 12"